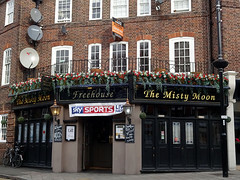 It's a former Wetherspoon's pub (at which time it was called the Sylvan Moon), and several clues to its past are still visible to those who look carefully. Three spacious booths at the back have padded banquettes and wood-and-stained-glass separators. Carpet covers the floor, with a pattern rather on the modern side in the context of pub decor. The rest of the space is filled with sturdy upright chairs and tables. Fabric orchids sit on the tables alongside Thai menus and wine lists. Kake visited on a Thursday lunchtime in late November 2015. When I arrived a little after 12:30pm, there were half a dozen other customers in ones and twos, plus a large group in for lunch. Christmas music was playing via videos on three large flatscreens above the bar, loud enough near the bar that it was a little hard to hear the barstaff, but less obtrusive further away. Four of the six handpumps were on, offering Courage Best, Greene King Reserve IPA, Greene King Benjamin's, and Greene King Fireside. A pint of lime and soda was £2 (and a good 4cm short of being an actual pint). The pub incorporates a Thai restaurant called Siam River; food is served throughout the bar, but ordered from the circulating waitstaff rather than from the barstaff. They also offer a small menu of "English dishes" such as sandwiches, burgers, and things-with-chips. In November 2015, Kake tried the pad prik gang with mixed seafood (£9 including rice) photo. It was OK. The seafood included prawns (fine), mussels (nice and big), and squid (rather chewy in places, and they'd also neglected to take the interior membrane off). The rice was a bit mushy. The vegetables — red peppers, cauliflower, carrots, onions, and green beans — were fine, though, and the sauce had a good flavour. The plate was decorated with a somewhat withered rosebud. Due to the large lunch party that was in at the same time, they warned me when they took my order that it might take up to 45 minutes to arrive, and it did in fact take almost exactly 45 minutes. The kitchen seemed to be struggling a bit with the size of said party, as their main courses came out in ones and twos over the course of about half an hour. When mine did come, it was accompanied by an apology for the wait. No service charge was added to the bill. Accessibility: No steps to get in. Step-free to the gents' once you're in, but three steps (with handrail) to the ladies'. Last visited by Kake, November 2015. Last edited 2015-12-02 14:58:28 (version 5; diff). List all versions. Page last edited 2015-12-02 14:58:28 (version 5).